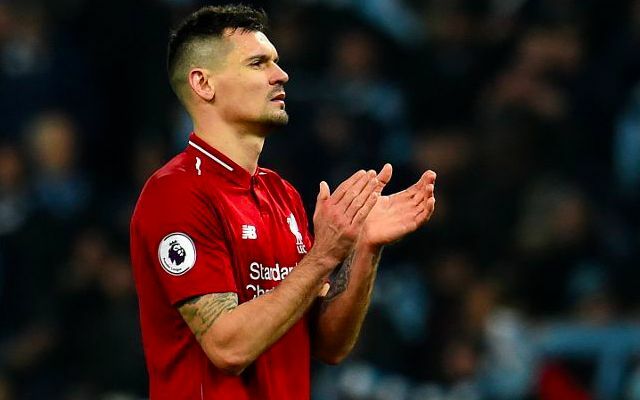 Liverpool are set to be without Dejan Lovren in Monday’s meeting with West Ham after yet another injury blow for the defender. The Croatian has not played since hobbling off with a hamstring issue in the sixth minute of the Reds’ 2-1 FA Cup defeat away to Wolves on January 7. Having been fit enough to return to the bench for Wednesday’s 1-1 draw with Leicester, Lovren now faces another spell on the sidelines. A recurrence of the same hamstring problem looks likely to rule him out of the visit to the London Stadium, according to the Echo’s James Pearce. Whilst his absence isn’t expected to be quite as extensive this time round, it does once again leave Jurgen Klopp worryingly short of options at the back. Virgil van Dijk and Joel Matip will continue at centre-back, with Fabinho seemingly the next in line to slot in were Liverpool to be hampered by another defensive injury. This could prove the case for the remainder of the month after Klopp revealed Joe Gomez may require surgery on his fractured leg. Setbacks in his recovery are threatening to see an initial six-week layoff, following his early withdrawal in the 3-1 win over Burnley on December 5, now stretch to 12 weeks. James Milner is meanwhile in contention to serve as a make-shift right-back as Trent Alexander-Arnold continues to nurse a knee problem sustained in the 1-0 win away to Brighton earlier this month.